The air handling system inside the House minimizes sharing of air between the guestrooms and the rest of the House. Also contributing to healthier air quality is natural ventilation throughout the spaces of the building. This ensures a healthier environment for children with compromised immune systems staying in the House while they receive outpatient care. The use of ample natural daylight in the guestrooms and in the four-floor core of the building supports a healing environment. Coordinate of strategies was shared with the adjacent Dell Children’s Medical Center. Kathy was the LEED Coordinator for The Beck Group for preconstruction services that started at the beginning of design and throughout construction until Substantial Completion. 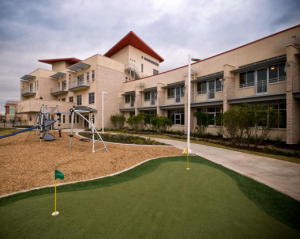 For more information about this LEED Platinum project for Ronald McDonald House Charities of Austin and Central Texas, visit their website at www.rmhc-austin.org.